Have you ever read an inscription on a gravestone that seemed so personal, so raw, you thought it could be a page from someone's diary? That's exactly how I felt when I read the love letter from Faye Wall to her husband Charles. You Were My Purpose And My Way. My Heart And Knock Upon My Mind. God Has Made No Other Eyes Like Yours. Slowly. No Hurry, Nobody's Waiting. 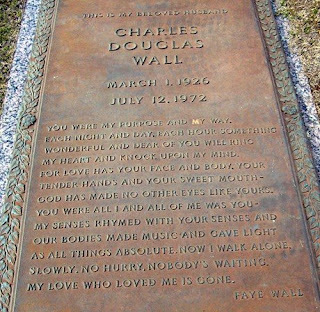 Mr. Wall is buried at Magnolia Park Cemetery; Warner Robins, Houston County, Georgia. How incredibly touching and heartbreaking. Thank you for sharing your find. Yes! I just posted it. Thank you very much for asking.